…looked at gains as major producers increased or maintained production while geopolitical tensions were relatively subdued. Libyan fighting took a breather and their export terminals and oil field productions sputtered forward. The four closed ports reopened and, for example, the El Feel oil field was producing close to 60,000 barrels per day (bpd) after returning from a five-month hiatus. However, storage tanks at the Ras Lanuf oil port suffered catastrophic damage after militants stormed the facility in June, limiting the comeback. Iran’s exports swung as certain buyers (such as South Korea) effectively halted purchases, though others (such as China) reiterated their commitments. India, another dedicated importer, gave permission to an Iranian bank to facilitate bilateral payments between the two countries. Iran also offered to insure oil cargoes to India after some insurers stopped providing the service in the face of impending U.S. sanctions. The Persian nation should be able to continue to export as much as it wants to these two countries alone even under sanctions due to their demand and financial ability to pay. Trump can increase their costs but the black gold will get out. Russia boosted oil production to levels not seen since it joined OPEC in a coordinated output cut. The world’s biggest energy exporter raised production in July to 11.2 million bpd (mbpd), a jump of 148,000 barrels from a month earlier and just below the post-Soviet record set in October 2016. OPEC oil output rose to a 2018 high as Gulf members pumped more after a deal to ease supply curbs and Congo Republic joined the group, a Reuters survey found, although losses from Iran and Libya limited the increase. Production was pegged at 32.6 mbpd in July, up 70,000 bpd from June’s revised level and the highest this year with Congo added. In particular, Saudi Arabia pumped near-record volumes in July, reaching 10.6 mbpd. However, Yemeni fighters supported by Iran hit a Saudi oil tanker with a missile and Saudi Arabia temporarily suspended oil exports through the Red Sea, affecting about 2 mbpd of its oil and product exports for Asia. Finally, Saudi Aramco announced their consideration to buy a portion of the Saudi chemical firm SABIC, which would likely delay an IPO next year as the acquisition needs time to be discussed and potentially finalized. Brazilian oil exports hit a record of 2 mbpd in July, nearly three times that in June and 50% higher than a year ago, as two oil platforms came on line. Finally, repairs at an important Canadian oil sands project (the Syncrude Canada joint venture) that impacted US supplies in June have been partially completed but are not expected to be finalized until late August. …stayed flat in July at 10.9 mbpd overall with an intra-month move up to 11.0 mbpd and a return to the beginning-of-June rig count, moving to 861 rigs on July 27th from 858 rigs on June 29th. There was a downward revision in May’s production but shale production is powering onward (see right). 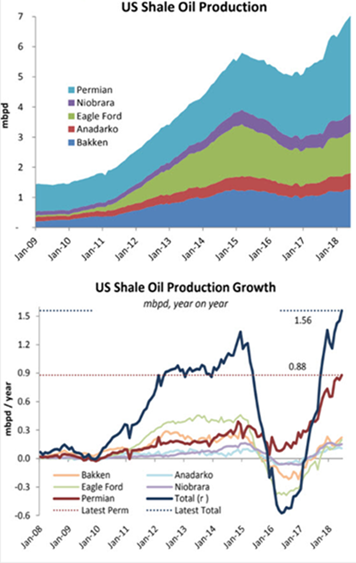 Production from the seven major US shale oil formations is expected to rise by 143,000 bpd to a record 7.47 mbpd in August, the U.S. Energy Information Administration (EIA). On the other hand, pipeline and export terminal capacity continues to constrain exports. For the week ending July 6, 2018, the four-week average of US gross refinery inputs surpassed 18 mbpd for the first time since the EIA began publishing that data series in 1990. US refineries are running at record levels in response to robust domestic and international demand for motor gasoline and distillate fuel oil and we see the high US gasoline inventories experiencing the seasonal summer draw. The Keystone XL crude oil pipeline project cleared a hurdle as the Trump administration said in a draft environmental assessment that an alternative route through Nebraska would not do major harm to water and wildlife. China’s largest refiner, Sinopec, announced that it will now hold off on buying U.S. crude. China’s crude oil imports from the US for July (6.9 million total barrels) have fallen sharply from June (14.7 million total barrels), and are expected to drop even further for August, vessel tracking data showed, as Beijing’s 25% tariff on US crude imports moved closer to implementation. …fell for a second month in a row to the lowest since December, as shrinking margins and volatile oil prices led some independent refiners, known as “teapots”, to scale back purchases. June shipments came in at 34.35 million tonnes, or 8.4 mbpd, according to data from the General Administration of Customs. That was down 9% from 9.2 mbpd in May (which was down from April’s levels) and also down from 8.8 mbpd in June last year. The shrinking margins are due to stricter tax regulations and reporting effective March 1st which means that these teapots have a hard time to avoid paying consumption taxes on refined oil profits, thus the lowering of margins. While this demand shrinkage is seen by some as temporary as automobile ownership increases, that may be a year off. Chinese crude inventories piled up at both state oil companies and independent refineries in H1 2018, which will likely cut the appetite for crude imports as destocking may occur instead. China’s June gasoline and diesel exports fell month-on-month, though are still up year-on-year. …on $34 billion of imports from China in early July with $16 billion to take effect August 23rd and $200 billion more possibly coming into play in September. China correspondingly imposed tariffs on $50 billion of US goods in early July and announced in early August potential tariffs on $60 billion of goods in retaliation. Interestingly, the list includes liquefied natural gas (LNG) tariffs to be increased to 25%, despite the supposed energy needs of an economy that is growing at +6.5% per year. Is their demand actually lower and the tariffs a cover? 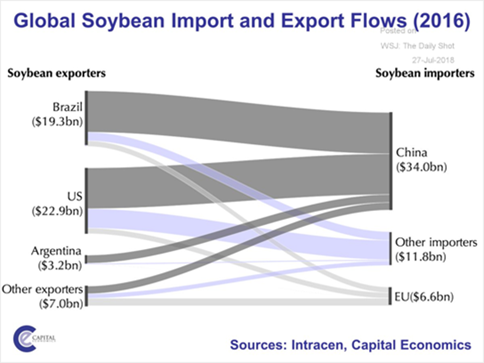 As a side note, the 25% tariff on US soybeans is projected to knock down Chinese demand by 11% per the USDA (62.3m tonnes to 55.5m tonnes), with the balance primarily to Brazil or going without. The US and EU are still negotiating over tariffs and the NAFTA talks continue as well. Modest duties into went effect in June and July over metals and various products. Finally, the first set of Iranian sanctions by the US came into effect August 7th, prohibiting Iran’s access to U.S. dollars, sanction Iran’s trade in gold and precious metals, outlaw the purchase of Iran’s sovereign debt, and sanction Iran’s automotive sector. Far tougher steps will come into force on November 5th, when the U.S. looks to cut off Iran’s oil exports and imposes sanctions on Iran’s shipping, among other measures. …included the plunge in industrial metals over the US-China trade war effects on their demand and economic growth generally. Copper is down 17% from its high in June and the overall London Metals Exchange Index is down 15%. This will affect not just China but also Australia, Chile, Brazil and other metals suppliers. Coffee is under pressure from record production in Brazil and speculative futures positions are record net short. No relief at your local Starbucks, however. High soil moisture content protected Ivory Coast’s cocoa plantings from below-average rainfall farmers said, maintaining their hopes for an abundant main crop season. US wheat is looking at declining yields and hot weather is cutting into the European and Australian crops. Corn and Soy production, however, are looking like record yields. Brazil soybean planted area could grow 2 to 5% amid the China-U.S. showdown, implying more soy to come from that direction.